The United States often lags behind Japan in getting the latest products and technology, and so the American version of Jake Shimabukuro's new album reaches local record stores next Tuesday, three months or so after it was released in Japan. 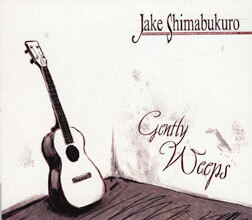 Better late than never, however, because "Gently Weeps" showcases Shimabukuro's artistry in three formats. The first 12 songs are solo recordings -- always the best way to appreciate his artistry. Next come instrumentals recorded with four different groups of musicians. Then, on the 17th, he yields the spotlight to vocalist Jennifer Perri, another Hawaii artist with Japanese connections. It's a smooth finale. There's an astute sense of flow and progression throughout. Shimabukuro opens with an emphasis on pop hits and jazz standards that display his skill at rapid-fire picking and strumming. There is also "Sakura," a nod to his huge Japanese following, and "The Star-Spangled Banner," which acknowledges his American citizenship. The mood becomes more tranquil and introspective as the album continues, and then picks up energy as the "bonus tracks" build to a high-energy guitar rock number. 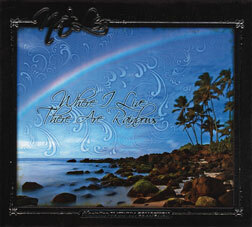 "Wish Upon My Star (vocal version)"
Na Leo gets back to basics, and to their Hawaiian musical roots, with this beautiful album (in stores Tuesday). Smooth three-part harmonies are the foundation of almost all the arrangements, and most of the songs are Hawaiian or hapa-haole standards. This is the vocal style that has defined Na Leo for more than 20 years, and the type of material that almost always brings them the greatest success. The album title is also the opening of the first song, "Hawaiian Lullaby," which in addition to setting the theme also reflects the fact that many people know the song by those words rather than the actual title. By the time Na Leo finishes singing those first six words the mood has been set for all that follows -- one beautiful song after another. Two songs depart from the theme. Na Leo slips in a touch of Jawaiian-lite with "Rhythm of the Ocean," and then renews their ties with composer Daniel Ho with a catchy version of "Along for the Ride." The arrangement of the latter is light rock rather than hapa haole, but fits nicely nonetheless. 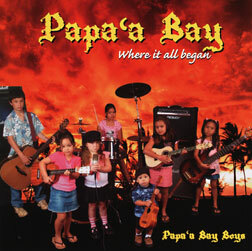 The Papa'a Bay Boys are like many young Jawaiian bands in crediting a full group of studio musicians as "the key to the production of our first CD." But even if the Boys contributed primarily as composers and vocalists, they show they have something to share. Seven songs are identified as originals; credits for the other three aren't provided, but two sound like the work of earnest young local writers. "Sweet Like Sugah," written by vocalist Ryan McKeague, opens the album with an appeal from a "big belly man" that the woman he's after not "judge a book by its cover." The Boys step it up with "Tonight's the Night," a newly written Jawaiian booty song that has all the ingredients of a local hit -- catchy rhythm, strong lyric hook and a timeless theme. Keala Kauanui and Sergio Hertado share the credit for this one, and it should establish the Boys wherever Jawaiian music is played. A plodding remake of "When I Look Into Your Eyes" is a throwaway, but with originals inspired by paniolo, loved ones, "domestics" and Papa'a Bay, the Boys establish themselves as a group to watch for.